This fireplace has matching profiling to the frame for maximum impact. A fireplace design with clean lines and real charm will look fantastic in most room settings. Shown with, Brick Bond pattern design to Vermiculite chamber and Bela Vista multi fuel stove, also available in a gas version. The Zamora fireplace incorporates a honed black granite hearth, however we can supply with a matching stone hearth if so desired. The Bela Vista multi fuel stove shown, incorporates the following features: Very large ceramic glass panel to door, so you can enjoy watching the fire burn with maximum effect. Air wash system to glass. Attractive design. 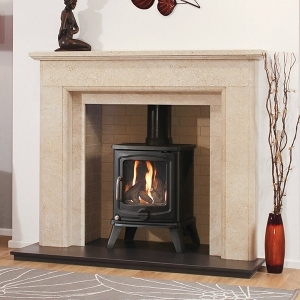 Up to 7.5kw nominal heat output when burning logs or 7kw when burning smokeless fuels. Clean burn technology. CE approved. (Please see our stove brochure).